Just how generous are Detroit's worker pensions for retirees? Just how generous are Detroit's pensions? Bankruptcy or not, Detroit's emergency manager, Kevyn Orr, says the city simply can't afford the pensions it has promised tens of thousands of retired and current city workers, many of whom are counting on the checks to make ends meet. So how much money do Detroit's retirees actually get? On average Detroit's firefighters, police officers and other city employees receive pension checks that are similar or slightly smaller in size than the national average of $30,000 a year, according to pension experts. But compared with larger cities that have higher living costs, like Chicago and Los Angeles, Detroit's pensions checks often pale in comparison. "My basic takeaway was that [Detroit's] pension system itself was not overly generous," said Jean-Pierre Aubry, assistant director of State and Local Research at Boston College's Center for Retirement Research. Related: Retired Detroit firefighter: "My pension is what I was promised"
While workers who reach the city's top posts, like police or fire chief for example, can retire with annual pensions that reach into the six-figures, the vast majority receive much smaller payments, Aubry said. Retired general city workers, such as librarians or sanitation workers, received average payments of $18,275 a year in 2011, according to the Detroit General Retirement System. But those who put in the most time (or earn higher salaries) can see far healthier payments. A general city employee who retired in 2011 with an average ending salary of $60,000 and 40 years of service could receive around $45,000 a year. Such benefits are more or less on par with the Detroit-area union auto workers. Retirees of the three big automakers receive average annual benefits of about $18,000 per year, in addition to another roughly $15,000 to $18,000 in Social Security payments, according to the United Automobile Workers, or UAW. That's a big distinction: While retired Detroit firefighters and police officers receive more generous pension checks than auto workers -- checks averaged almost $30,000 a year in 2011 -- they often don't receive the added bonus of Social Security payments. A 30-year veteran of the fire department who retired last year with an average ending salary of $60,000 would have qualified to receive around $44,000 a year, according to calculations using the plan's pension formula. 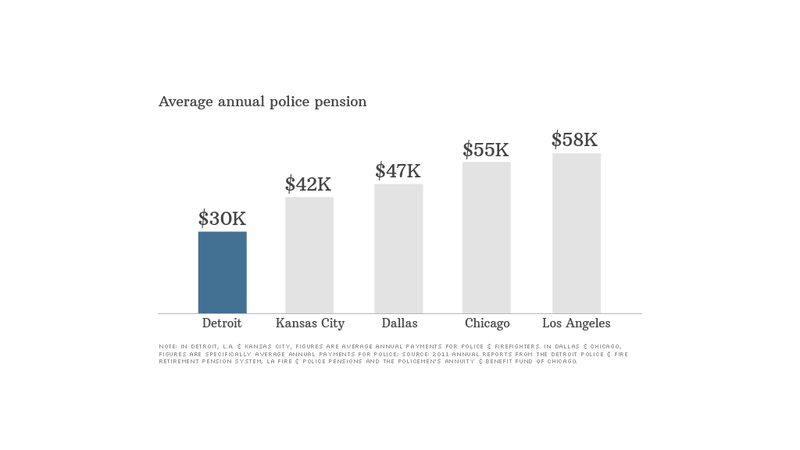 Police officers and firefighters in big cities often take home much more lavish pension checks. For example, with average annual benefits of $55,104, retirees of Chicago's police force took in nearly double Detroit's retirees. Meanwhile, retired Chicago firefighters had average annual payments of more than $60,000. Chicago has its own budget woes, however. Last week, rating agency Moody's downgraded the city's credit rating, citing ballooning pension obligations. Even retired police and firefighters in Kansas City, Mo. -- a city with roughly two-thirds the population of Detroit and a similarly affordable cost of living -- take in more, with average annual payments of almost $42,500. Still, it isn't all bad news for city workers. Since Detroit's firefighters and police offers are able to retire a decade (or more) before they reach the typical retirement age of 65, retirees can receive their benefits for decades. In addition, many retired officers have time to pursue other careers and accumulate additional savings. In addition to a lifetime of payouts, city workers also receive retiree healthcare, a benefit that is rarely offered by private sector employers. They can also extend their pension benefits to a spouse after they die by opting for smaller monthly pension checks, said Don Taylor, president of the Retired Detroit Police and Firefighters Association. The amount the payments are reduced by depends on the spouse's age. Taylor himself receives about $2,500 a month from his 26 years in the Detroit Police Department, about a few hundred less than he would receive if he hadn't opted to include his wife in the plan. Taylor, 64, will also receive a small Social Security check from his 10 years as a travel agent. But other than that, he has no other retirement savings. Regardless of whether Orr's proposed cuts go through, pension checks for younger employees will be less generous, said Leon LaBrecque, founder of a Michigan-based wealth management firm, who has worked with hundreds of Detroit city retirees. Current workers have already agreed to pension cuts. For example, in 2011, Detroit police and firefighters agreed to a roughly 15% cut for pension benefits accrued from future years of service. 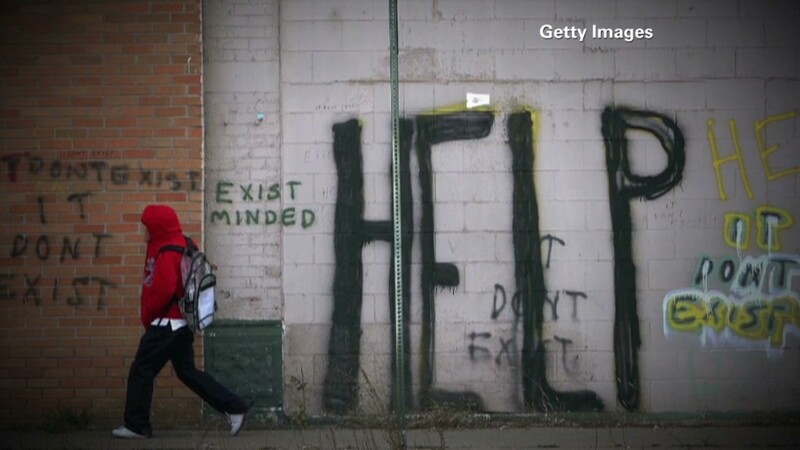 "There's this myth that everyone in Detroit is getting a fat pension," LaBrecque said. "But that's clearly not true."